Introduction:In this article i will explain the way to highlight GridView's row on mouse over i.e. 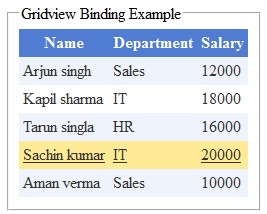 when you move cursor over any GridView row it will get highlighted.It also looks attractive and give your application a new innovative look. There are many other ways to do this but using easiest and the optimized way is to use CSS class. Implementation: let's create a web page to see it in action.
" I hope you have got the easiest CSS trick to highlight gridview row on mouse over in asp.net and If you like my work; you can appreciate by leaving your comments, hitting Facebook like button, following on Google+, Twitter, Linked in and Pinterest, stumbling my posts on stumble upon and subscribing for receiving free updates directly to your inbox . Stay tuned and stay connected for more technical updates."